United Way of the Coastal Empire sincerely thanks our Loyal Contributors for their faithful investment and commitment to our community. If you have been giving to any United Way for 10 years or more, please let us know. For more information, please contact Jenny Grusheski at 912.651.7715. She chooses to Live United everyday! 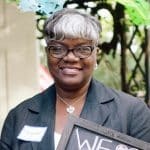 Since she started with her career at the City of Savannah in 1995, Margaret Williams has been giving to United Way and encourages others to follow her step. She’s proud to say that she has been a Beacon donor for the past decade, giving at a leadership level of $1,200 or more. Throughout the years, she has served on various United Way committees, all aimed at finding ways to better support programs and services to help those most in need in our community. Giving to United Way was one of the ways they chose to give back. As executive director of the Savannah Speech & Hearing Center, Dr. Beth McIntosh knows well the positive impact made by funding from the United Way. It should come as no surprise, then, that Beth is a longtime contributor to those funds. Beth became director in 1998. United Way’s Loyal Contributor program recognizes donors whose giving history spans 10 or more years. Beth, having donated for more than a quarter-century, qualifies as a Diamond contributor – the program’s highest honor. The Savannah Speech & Hearing Center each year helps more than 17,000 people who have real or potential communicative problems. The center provides a wide range of comprehensive speech, language, and hearing care; its staff also conducts hearing screenings for thousands of youngsters at local schools. Beth, a Savannah native, in recent years has led fundraising campaigns for all United Way-funded programs.